Google has shut down or restricted a lot of their services for the past two years, services like ads on feeds, Google's project hosting, Google Friend Connect and others. This has been done to focus or to upgrade most of their products that they serve to their users. Now, to add more services on these lists, Google announced officially that Google Reader will be removed this coming July 1, 2013 as posted by Google on its official blog. The removal of this RSS reader, that has been in service for the last eight years, is due to Google's Spring Cleaning that began two years ago. This action is usually done by companies to stop the support on some products or services they are offering that might or has been considered obsolete or has been losing its loyal users. Google Reader was launched on year 2005 as a way to keep track of the users' favorite websites. It has been one of the known free RSS readers on the market. Though there are still registered users for this service, the amount has been declining recently and so the company planned on closing it down. The remaining time is given for the users to export their data using Google Takeout and are advised to transfer it to an alternative RSS Reader. Other related software such as Apps Script's GUI Builder and five UiApp widgets, CalDAV API, Google Building Maker, Google Cloud Connect, Google Voice App for Blackberry and Search API for Shopping are reported to be shutting down or being restricted too. As an effect, many felt sad of this issue. 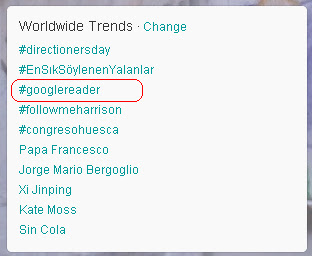 Even Google Reader trends on Twitter world wide. Twitter users show their sympathy on what happened. Aside from this, a small clip showing Hitler's dismay was posted by leebdough on YouTube. I don't know what Google was thinking when they decided to shut this down. Makes me scared about my other Google accounts. Which ones are gonna be killed off? May be I used Google Reader in 2005/6 to actually read something, even though it pushes many users into anger- it has to go- and it's going now.